Bugs Bunny takes on Michael Jordan in the out-of-this-world 1996 family adventure coming to Blu-ray in October. 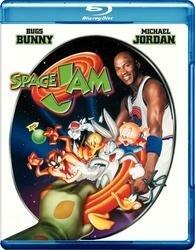 In an early announcement to retailers, Warner Brothers is working on 'Space Jam' for Blu-ray on October 4. The movie raked in over $90 million at the box office and R. Kelly won a Grammy for the best original song specifically for a motion picture or TV show -- "I Believe I Can Fly." Specs and supplements have yet to be revealed, but suggested list price for the Blu-ray is $19.98. You can find the latest specs for 'Space Jam' linked from our Blu-ray Release Schedule, where it's indexed under October 4.